Space Weed | HappyChap Creative Co.
We collaborated with a Washington-based licensed cannabis producer/processor to create a brand identity for their uniquely cured products. From concept to collateral, we developed a cohesive visual system and marketing voice to help Space Weed continue growing. Struggling with low brand recognition in a highly competitive market, our client needed to build relationships with new cannabis retailers and educate retail employees in Washington about their unique products. Our goal was to develop a new identity and visual style for them that would highlight their proprietary, high-tech curing method. And thus, Space Weed was born! Brand marks and icons were developed for multiple uses along with a sub-brand for the proprietary curing process. The distinctive geometric font family Filson by Mostardesign Type Foundry was chosen to fly a daring solo-mission, carrying the brand in all uses. Working within the client’s budget & design constraints, we developed a packaging system to display strains using the imagery of colorful nebulae and galaxies far, far away. Pat Beggan provided retouched advertising imagery, studio packaging photography, macro cannabis strain photography, and location photography. 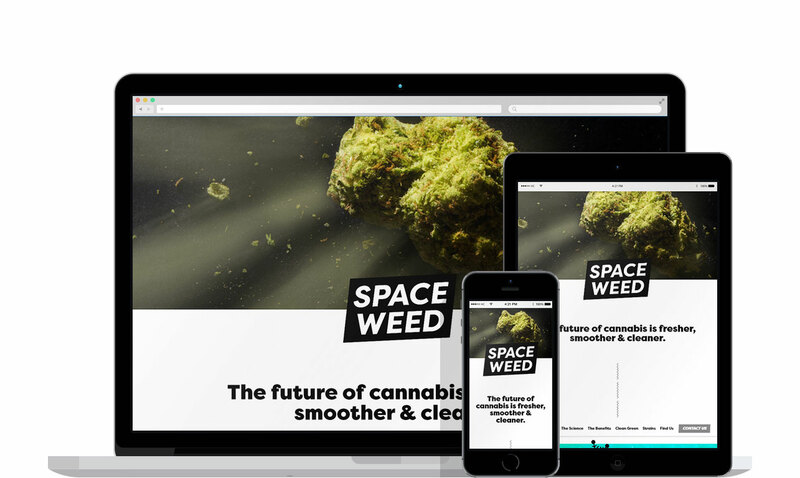 A fully custom single-page website was designed to guide and encourage retailers to learn & inquire about Space Weed’s strains, cultivation techniques, and unique curing process. Several months after launch, Space Weed has reported excellent feedback on the new brand and packaging. You can find them on the shelves of licensed cannabis retailers throughout Washington State (if you’re over 21, of course). Hire us, collaborate with us or yell at us. An event space & members-only social club + coworking office. Nestled in dreary & cheery downtown Bellingham, WA.